Questions? Read the Public Policy FAQ. Local visits with your member of Congress can have a more profound impact then visiting them at Capitol Hill. A local visit with your member of Congress is when you schedule an appointment with him or her during Congressional recess when they are back in their state. Please consider scheduling a meeting with your member of Congress. 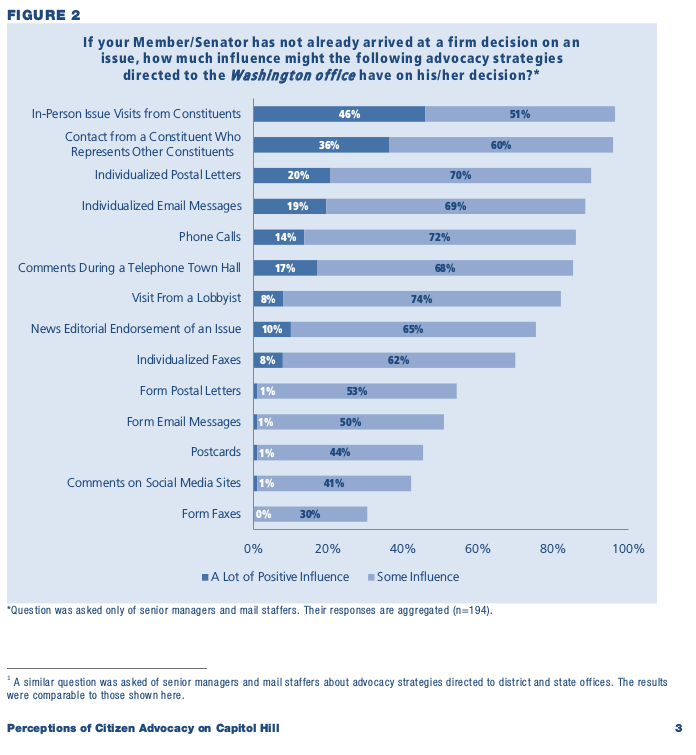 You will quickly note that constituent visits are by far the most "very effective" type of advocacy. You will also note that these data do not differentiate between local visits and Hill visits. If you try to visit your Congressman or Congresswoman in Washington, DC then you are more likely to meet with a legislative aide. Congress is typically busy with debate, voting, and hearings while on the Hill in Washington. During the days when they are back in their home state they make an effort to connect with their voters. Many have town halls or other opportunities for voters to express concerns, ask questions, or comment on an issue. Bottom line: When the Congressman or Congresswoman returns to their home state, they are trying to connect with you, want to hear from you, and want your vote. Here is an overview of the process of setting up a local visit with your member of Congress, refer here for more details. There are three stages to organizing an effective visit: preparation, the meeting, and follow up. Preparing for the meeting includes requesting the meeting and the background research that you do prior to the meeting. Before you meet face-to-face do your homework and check their stance on the issue you are talking to them about and look up their voting record on the issue. You can find most of this information from their website. At the meeting, start by thanking the person for their time. Communicate your prepared message. Try to keep this a conversation; leave space for them to ask questions. Remember this rule: do no harm. You want to make sure your issue gets a positive reception and that you do not cut your line of communication to your member of Congress. You must follow-up after your visit. Thank the person for their time again, reiterate your issue, and provide any additional information you promised during the meeting. More details can be found on our Setting Up a Meeting with Members of Congress page. AAS Public Policy recently joined a multidisciplinary group of science societies to organize local visits in key districts or states during the August 2017 Congressional Recess. Those visits will happen 29 or 30 August 2017. The primary goal of this effort is for multidisciplinary groups of scientists to meet with Members of Congress or their staff in their home districts/states during the Congressional recess. The topic of the August 2017 meetings will be the FY 2018 appropriations process. With decisions on the FY 2018 appropriations bills soon to be finalized, it is vital that we communicate to Congress the importance of federal investment in science. Our hope is that a multidisciplinary group of scientists will be best suited to communicate the broad importance of federal investment in science. We are grateful to the 60 AAS members who expressed their interest in participating in these meetings. We will update this page with information about our outcomes. If you are interested in participating in future events like this, then please fill out this form. When will future Recess Visits happen? Hopefully, during the next congressional recess. Check the congressional calendar for information about the next congressional recess. What will the topic or message be for future Recess Visits? This depends a lot on what topics or issues the Congress is currently debating. Check our page of Information about Relevant Policies to get an idea of what debates are currently ongoing. How do you decide which districts or states are "key?" We have to decide who we think is the best audience for our message; this means that the districts/states that we deem key will depend on the topic or message. For example, our first event focused on congressional leadership. This included the top Republican and Democrat of the Appropriations committee and of the subcommittees because we were focusing on the FY 2018 appropriations bills. If my district or state isn't deemed "key," then does that mean I shouldn't bother meeting with my member(s) of Congress? No! You should absolutely meet with your member(s) of Congress! Ideally, we'd have the resources to arrange meetings with every member of Congress, but we don't. The group isn't focusing on my district/state, but I still want to meet with my member(s) of Congress; will AAS help me? If you need help beyond the information on this page, then please get in touch with AAS Public Policy. We can help you figure out who to contact, help develop or perfect your message, or provide leavebehind materals. Do I have to be a US citizen to partipate in these events? Following our advice for effective advocacy that you should only visit your members of Congress, participants should be registered to vote in federal elections. Why Should You Advocate for Your Science?